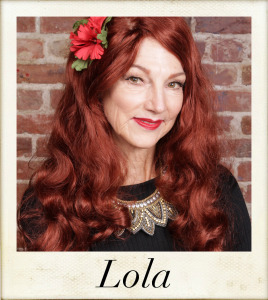 Finding Lola: it takes a village. Sign up now! Finding Lola: How Breast Cancer Freed ALL of Me, a One Woman Show by Diane Estrada. Diagnosed with an aggressive stage of breast cancer, my husband and I chose a distinct perspective in going through my illness. Rather than “just getting through it” -- with the help of five wigs and a zest for life and love, I had a complete healing of my cancer, a profound awakening of hidden personality attributes, and a deepening of love in my relationship. With enthusiastic appreciation to: Mariana Williams, Avé Micco, Monica Walleser, Sue Ann Cross, Patty Turrell, Tom Engle, Don Burkhead, Kimberly Williams, Karen Johnston, Joanne Baker, Cathy Carpenter, Carol Gardner, Ginni Gordon, Robin Mickle, Beverley Danusis, Teresa Russel, Julie Sutton, Brianne Cavanaugh, Olivia Tran, Tony DeRosa, Don Aakhus, Kent Schisler, Anita Mishook, Julie Baxley, Laurie Parie, Martha Guzman, Anja Lueckermann. and several anonymous donors.